After decades of relative inactivity in the Atlantic basin, Hurricane Andrew marked the first time in modern history that a Category 4 or Category 5 hurricane had directly threatened a large American city. As people across the country watched, the tightly wound storm took aim on downtown Miami. On August 23rd, 1992, journalists and camera crews positioned themselves in iconic areas throughout the city. By 1am on August 24th, winds were howling across Dade County. Employees at the National Hurricane Center, then located in Coral Gables, had the dual task of monitoring the storm and protecting themselves as windows shattered in the upper floors of their building. Hurricane Andrew strengthened up until, and slightly after, its South Florida landfall. The storm was extremely well shaped, and easily had the most intense and symmetrical eyewall ever captured up-close by land-based radar. At the break of dawn, the eye of the storm was entering the Gulf of Mexico and the winds across Dade County had begun to die down. Daylight revealed extensive damage across the city of Miami and Coral Gables. Strangely, however, there was little word from areas farther south. A last minute dip in the storm’s path meant that the urbanized areas south of Miami, from Kendall to Florida City, had taken the brunt of the storm. Despite the widespread use of video cameras in the early 90’s, no clear footage exists of the storm at its height. Nearly all of the videos taken south of 152nd Street end abruptly at 4am. 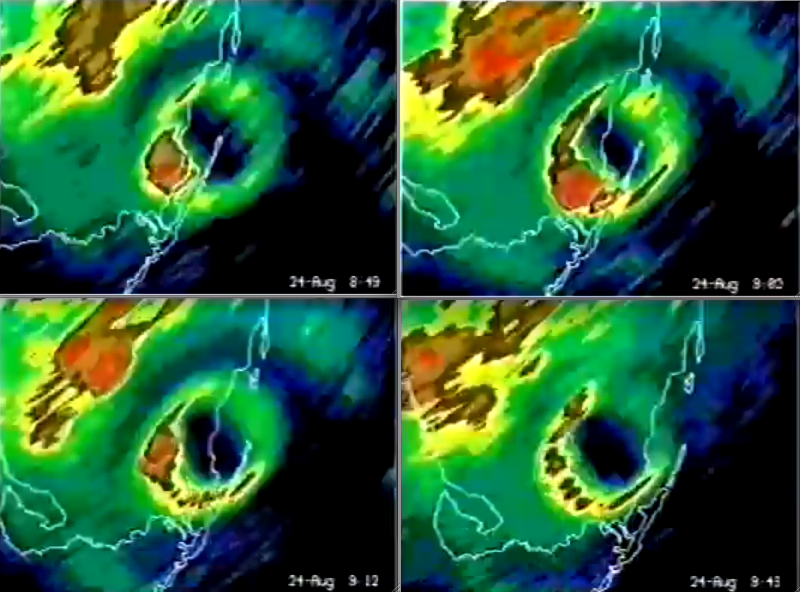 Few videos exist of Hurricane Andrew’s landfall in Dade County. At top left, a clip from a journalist and his cameraman as they filmed the hurricane throughout the city, spending the majority of the storm on South Beach. At bottom left, Dennis Smith from the Weather Channel broadcast live footage of the hurricane in Coral Gables. 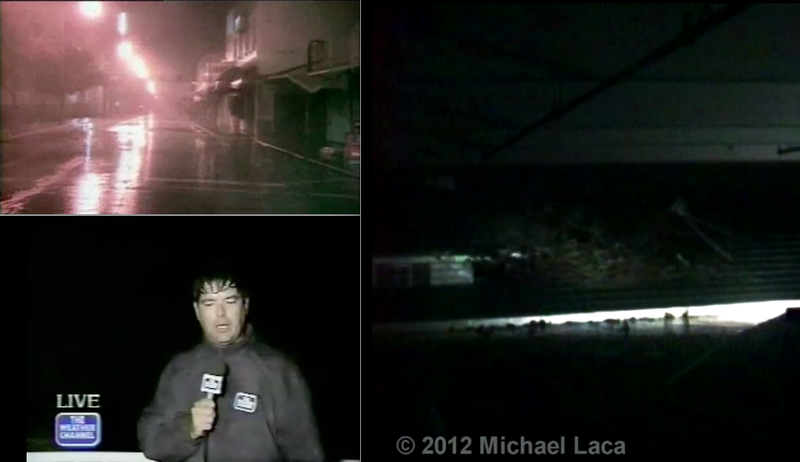 At right, storm chaser Michael Laca recorded the duration of the storm in Coconut Grove. All three of these films were taken well north of the worst affected areas. Hurricane Andrew’s right front quadrant came ashore in the vicinity of Cutler. As would be expected, the maximum storm surge of 17ft occurred in this area. Due to the storm’s fairly rapid forward speed, the most extreme winds should have occurred along the immediate coastline of Cutler and East Perrine. And indeed, the damage was astounding. Trees in the area were stripped bare, and some homes near the shoreline were unroofed and partially leveled by wind gusts in excess of 175mph. The Pinewood Villas, a one-story apartment community in Cutler Ridge, experienced some of the most severe wind damage in the area. Several apartment buildings in the complex were completely leveled, and the remaining units suffered extensive internal damage as doors were ripped from their hinges. Professor Fujita toured the damage at the Pinewood Villas and noted the inconsistent nature of the destruction, which was reminiscent of the narrow streaks of damage left by tornadoes. A little farther inland in Cutler, the hurricane punched through the windows and walls of large retailers and completely gutted a two-story furniture store. Due to Andrew’s incredible power and brisk westward motion, areas well inland were affected by wind gusts over 150mph. The Tamiami Airport, located 10 miles from the coast, suffered tens of millions of dollars in damage. Airplanes were flipped and rolled into piles, and the airport’s hangars were shredded to their metal frames. During the storm, even though routine weather observations had ceased operation, the official weather observer at the airport continued to keep track of the station’s wind dial. Around 4:45am, he noted that the needle became pegged at a position beyond the instrument’s peak value (later shown to be a bit over 120mph). The needle remained fixed at this point for three to five minutes before dropping to zero as the anemometer failed. The weather observer reported that the winds increased in intensity for another 30 minutes, so it is quite likely sustained winds well over 120mph affected the Tamiami Airport (NHC, 1992). At left, damage to the Tamiami Airport, which was located 10 miles from the coastline and north of the storm’s eye. At right, the devastated Dadeland Mobile Home Park, which was located several miles east of the airport. Andrew was a rather fast moving storm, so winds in the northern half of the eyewall should have been more than 35mph stronger than winds in the southern eyewall. Despite the destruction in Cutler and Perrine, however, even more intense damage was found farther south. Arguably the most severe wind damage caused by the hurricane was four miles inland in Naranja Lakes, a small community just north of Homestead. The devastation was unusual because the area was near the geographic center of the storm’s path, well away from the onshore winds that affected Cutler Bay. Even more unusual, survivors in Naranja Lakes and Homestead told surveyors that the most extreme winds occurred during the back-eyewall of the hurricane. One woman in Naranja Lakes was fatally injured as her home was destroyed by southerly winds following the passage of the eye. 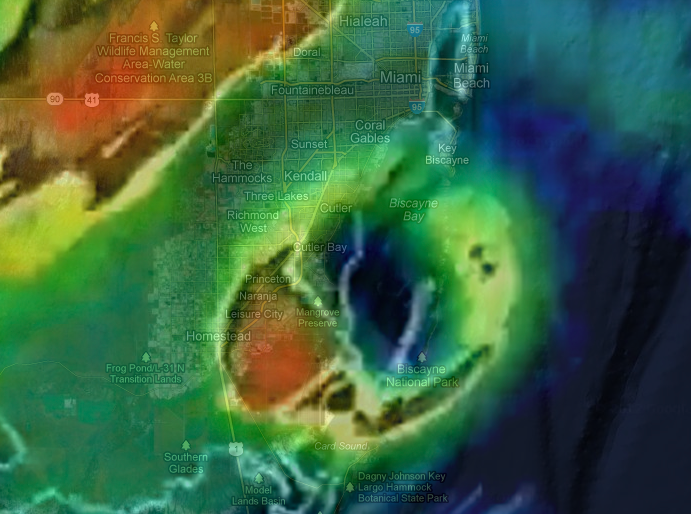 Radar views of the hurricane provided some clues as to why its southern eyewall caused such incredible damage in Naranja Lakes, Homestead and Florida City. The Miami radar failed as the leading edge of Andrew’s eyewall came ashore, and the Key West radar ceased functioning when the power went out across the region, so no radars within 200 miles of Homestead captured the hurricane as it crossed the coastline. Radar in Tampa, however, was able to fill in the gap, though with slightly less detail due to its distance. As the hurricane came ashore, radar images showed powerful convection cells forming over Homestead and nearby areas in the storm’s southern eyewall. It is likely these dense cells of precipitation led to extremely intense bursts of wind that may have reached 200mph. View of massive convection cells in Hurricane Andrew’s southern eyewall. These features may explain why the most intense damage was not found in areas affected by Andrew’s right-front quadrant, traditionally the most violent section of a hurricane. The convection cells were not as visible in the storm’s back eyewall, where the most intense winds may have occurred, possibly due to interference from precipitation to the west. The approximate position of the radar velocities. Areas beneath the bright orange cell include Naranja Lakes and the Homestead Air Force Base. Images of some of the strongest hurricane winds ever filmed. At left, storm chaser Mike Theiss’s footage of the strongest hurricane winds ever captured on video during Hurricane Charley. Peak wind gusts in the film are likely between 150 and 160mph. At right, legendary storm chaser Jim Leonard captured gusts of 130mph or more whipping through palm trees in Puerto Rico during Hurricane Georges. Peak wind gusts in Hurricane Andrew may have topped 200mph. The whole home shook as if it was going to be ripped from the ground. We could hear furniture banging against the walls and being blown out the windows. You could hear some of the gusts right before they hit – it sounded like jet planes were taking off right over us…I was sure we both were going to die. Unlike most US hurricanes, the majority of Hurricane Andrew’s deaths were caused by its winds. Falling trees are generally the biggest killer, but the deaths in South Florida were more consistent with tornado-related fatalities. Half of the 15 deaths directly attributed to the storm occurred in the collapse of frame homes or apartment buildings. Additionally: two men sheltering together in a metal storage trailer west of the Tamiami Airport were killed when the container was flipped several times. One man, who was also more than 12 miles inland on SW 198th Street, was killed by flying debris while running for shelter after the building he had been in collapsed. Two more deaths occurred in two separate mobile homes that were obliterated. Only one of the deaths was the result of drowning. (Natural Disaster Survey Report, 1993). A third of the deaths occurred more than 10 miles inland. 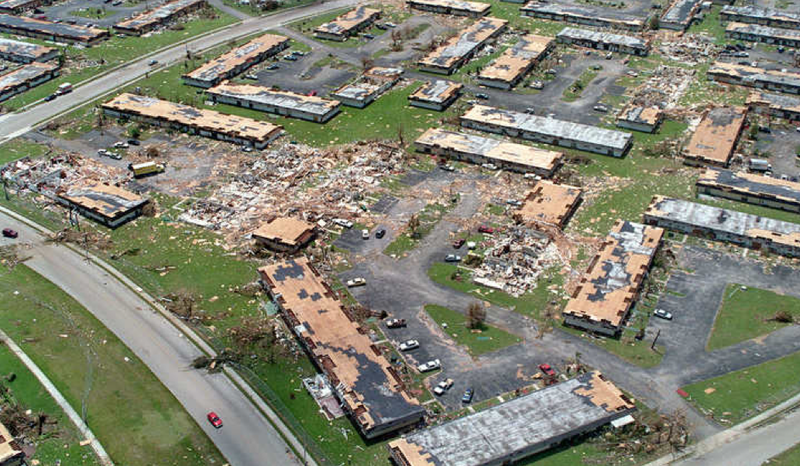 Extensive research in the decade following the storm concluded that Hurricane Andrew was significantly stronger than previously estimated (the official intensity at landfall in Homestead was originally 145mph). In 2002, the hurricane was posthumously upgraded to a Category 5 with maximum sustained winds of 175mph. At landfall in Homestead, the storm’s winds are now estimated to have been 165mph, even though the storm’s lowest pressure of 922mb was recorded at this time. The complicated and isolated nature of the wind features in Hurricane Andrew make a single intensity estimate almost impossible to calculate. At left, view of the NHC’s updated wind contour map of Hurricane Andrew at South Florida landfall. Despite being vastly more accurate than the official intensity prior to the 2002 addendum, the contour map still is unable to account for the extreme wind damage south of Cutler Bay. At right, the contour map overlaying a map of the area. Hurricane Andrew remains one of only two Category 5 hurricanes to ever make landfall in the United States. * The storm redefined the concept of a hurricane to a whole new generation and left lasting scars in South Florida that are still visible 20 years later. More than anything, the storm highlighted the continued discrepancies that exist between National Hurricane Center estimates and the actual surface conditions in landfalling hurricanes. *Hurricane Camille’s official landfall intensity of 190mph, according to many objective sources, is inaccurate. The storm was very likely under Category 5 intensity when it crossed the Mississippi coastline. Andrew was an atypical hurricane in many ways, and a rare one. It was compact, small, which may have contributed to it’s maintaining very high wind speeds at landfall in South Florida. It was just very tightly wound and compact, and that together with the totally flat landscape in South Florida, and the brief amount of time it was over land, caused it to maintain very high strength. If it had been a larger storm, it may have weakened more, but also it’s trajectory had something to do with it. Andrew took a sharp left turn out around the Bahamas, and just went straight west across the tip of Florida into the Gulf, whereas most hurricanes tend to be steered or turn and ride along the coast more, which weakens them more. Andrew was a perfect storm in that sense. And it was very dry, unusual for a hurricane. Andrew was all wind. Most hurricanes do their damage in storm surge/flooding, and the wind damage is secondary. Andrew did virtually no water damage, save for some inland flooding and marina areas.Sustained winds at landfall were ~165mph, well into Category 5 range, and gusts as high as 190mph I have heard. The most recent analog to Andrew may be Hurricane Charley which struck Punta Gorda on the west coast of Florida in 2004. Charley was fairly fast moving, rapidly intensified as it struck land, like Andrew, and very small and tightly wound, Charley did immense wind damage to the Punta Gorda area. Of course due to the disaster of Katrina a year later, Charley was forgotten, but it hit as a strong Category 4 storm, and was the strongest landfalling US hurricane since Andrew. Charley was even stronger than Katrina at landfall, in terms of windspeeds, but of course Katrina dwarfed it in size, pressure, and storm surge. Katrina was a strong Cat 3 at landfall with Cat 5 storm surge. Hurricane Charley was likely the third strongest hurricane to make landfall in the United States since 1930 in terms of sustained winds. What made the ’35 Labor Day, Andrew and Charley so particularly violent, beyond what you said in regards to size and path, was the fact they were intensifying as they made landfall. Any hurricane chaser knows that an intensifying storm with winds of, say, 100mph feels more intense than a weakening hurricane with winds of 110mph. That has always been my experience chasing hurricanes. Yep, I’ve heard Charley was even stronger in terms of winds than Hugo in 1989 which was a very powerful Cat 4 storm also. I think Charley’s sustained winds at landfall were ~145 mph, & Hugo’s were ~135mph with higher gusts. But Hugo had been much stronger down in the Antilles Islands by the time it reached the US it was barely a Cat 4. Andrew & Charley were intensifying you’re right about that. Charley hit in the broad daylight which is unusual, and some of the video clearly show how powerful the winds were with it. Hugo was larger than Andrew & Charley, but not nearly as large as Katrina. If Charley had stayed over the Gulf a bit longer before hitting west Florida, it probably would have easily reached Cat 5 strength.I think there may be a meteorlogical reason why tightly wound compact hurricanes tend to be stronger in terms of winds, like maybe the winds are just more concentrated and spin faster than in a large, spread-out hurricane which is more diffuse. I wonder if any records exist to show how large the 35 Labor Day hurricane was in terms of size, would be interesting to see if it too was a compact small storm like Andrew & Charley, hence the very powerful winds it produced. The Labor Day hurricane I have heard had SUSTAINED winds at ~190mph truly a monster! Experts are predicting an active season this year, hard to say when we’ll see another US Cat 5 landfalling again, but they seem to hit on average about every 30 years or so. But if you believe in climate change as I do, it may not be as long. I would bet the next Cat 5 that hits will be in the Gulf or in Florida though, not the East Coast, because the shear tends to be less in those areas and the water is so much warmer and conducive to rapid intensification. The Labor Day Hurricane was one of the smallest on record. I’m too lazy to look up the exact statistics, but it was significantly smaller even than Andrew. Hurricane force winds extended only 20 miles or so from the center, leaving Miami and Key West with only gale force winds. Storm size is one of the most important factors in wind development as the pressure gradient is directly correlated with surface winds. This is the reason I do not believe Typhoon Tip had winds as strong as smaller, more tightly wound storms with extremely low pressures. As a result, I believe the storm – with its extremely low pressure and small size (and gradient of more than 7mb per mile+) was one of the most intense in recorded history. Sustained winds likely were in excess of 200mph in a small area that affected Matecumbe/Islamorada. Andrew had the most symmetrical & perfect donut shape on radar I have ever seen with a landfalling hurricane. I think you’re correct it was intensifying just before landfall & even over land. I am no meteorological expert but I wonder if there is a historical pattern between the Category 5 storms that make landfall in terms of their latitude. For instance, in the last century, two of the three landfalling Category 5 hurricanes in the US occured in the same area, south Florida (Labor Day 1935 & Andrew ’92). The Florida penninsula is so flat & narrow, & extends so far south, that the sea temperatures are probably warmer there than on the East Coast & even the Gulf of Mexico basin. So therefore hurricanes have more potential to be at Category 5 strength when they hit the southern tip of Florida, due to its more southern latitude. Of course, with sea temperatures rising, this will probably make the chances of landfalling Category 4 & 5 hurricanes greater, whereas in the past, those storms might have weakened just before landfall, due to cooler waters by the coast, or shear interference. Of course Cat 4 & 5 storms are inherently rare regardless, that’s why only 3 Cat 5 storms hit in the 20th century. But south Florida seems to be prime real estate for 4 & 5 storms because of the factors I mentioned, and will continue to be so, I suspect. I still believe the most vulnerable US metropolis to a hurricane direct hit are Miami & Tampa. Andrew was a small storm which skirted Miami proper, just to the south, but if it had hit a bit north, it would have been catastrophic. Tampa is also highly vulnerable if a Charley-like storm hit it head-on. And then there’s New Orleans, of course. But to sum up I think the tip of Florida is the most likely place where a future Cat 5 will hit, due to its southernmost location & based on history. How exactly does a hurricane’s winds work differently from a tornado’s winds besides the fact that hurricanes only produce straight-line winds? For example, why does it take longer for a hurricane with 190mph winds to destroy a well-built house versus a tornado with 190mph winds that could most likely destroy a well-built house in a matter of seconds? Also speaking of strongest hurricane wind gusts captured on film, how strong do you reckon these winds gusts would be from Typhoon Yolanda? I personally believe that James Reynolds and Jim Edds both captured the strongest hurricane winds ever filmed. Having reviewed the few clips of their footage available at this time, I’d say they probably got footage of sustained winds near 145mph to 150mph with gusts to, perhaps, 170mph. The strongest winds ever filmed prior would have been in Hurricane Charley, particularly Mike Theiss’ gas station video, and were likely sustained around 140mph at its peak. Jim Edds has said that Typhoon Haiyan’s winds felt stronger than Charley. a) The vertical component of the winds, which undermines the expected force of gravity. b) Extremely rapid changes in wind direction and speed, which causes extreme structural stress due to wind acceleration and opposing velocity forces. c) The previous two attributes lead to perhaps 20x the amount of flying debris that would be found in a hurricane, leading to significantly worse damage. d) Tornadic winds are stronger. First two points are valid, but tornadic winds aren’t really that much stronger than what is found in the strongest hurricanes. The idea that they are really isn’t supported by the data. Do you think that Typhoon Haiyan could exceed Andrew in the amount of wind damage caused? Also, in regard to your previous comment; how much more damaging could you expect say a 150 or 190 mph wind in a tornado would compared with the same wind speed in a hurricane? In terms of the monetary price tag, I do not think Typhoon Haiyan caused nearly as much damage as Hurricane Andrew, but much of that is related to varying construction costs. In terms of the severity of the wind damage, both storms might be pretty similar in terms of the worst affected areas. Hurricane Andrew was an incredibly powerful hurricane wind-wise – proof that hurricane winds are much more complex than just simple pressure/gradient calculations. As for comparing tornado winds vs hurricane winds, my wind estimates for tornadoes are higher than what is commonly accepted. If you were to look at some “official” reports, they would say Hurricane Andrew brought sustained winds greater than 160mph for an hour or more to some areas in Cutler. Some reports also say the Jarrell tornado brought winds of 160mph to areas of Double Creek for 180 seconds. Andrew survival rate = 99.5%. Jarrell = 0%. True, but Double Creek probably experienced winds in excess of 300 mph, far beyond what any hurricane could produce. I had been thinking that since Andrew produced ~160 mph winds with higher gusts but, unless I am underestimating quality of construction, I have not seen pictures of wind damage from that storm equivalent to more than a low EF3 tornado. Though I do lean toward agreeing with you on the EF scale underestimating wind speeds. Exactly, Jarrell probably had winds over 300mph. I do not believe the wind estimates in the EF Scale are accurate, so I have a hard time comparing tornadic winds to hurricanes if I have no basis for comparison.